Lee’s infectious love song “Completely Yours”, inspired by the work of Czech-born French writer Milan Kundera , was a nominated finalist in the 2015 Hollywood Song Contest. The wide range and variety of Lee’s songwriting is clearly evident on the album – from the Mark Twain inspired foot tapper “ Strange Wild Time” , the breezy folk pop “Man Overboard” to the plaintive and brilliant “Quiet Sounds of War” , written about scenes in he town of Royal Wootton Bsssett in the UK that accompanied the repatriation British service men and women who fell in the wars Iraq and Afghanistan. Lee’s distinctive tribute to Sir Winston Churchill “Homburg & Havana” was also featured on BBC TV in the UK and the haunting ballad “Beautiful Sad” also attracted critical acclaim. If you like intricate and clever fingerstyle acoustic guitar coupled in strong melodic songs then give On Roosevelt a listen. 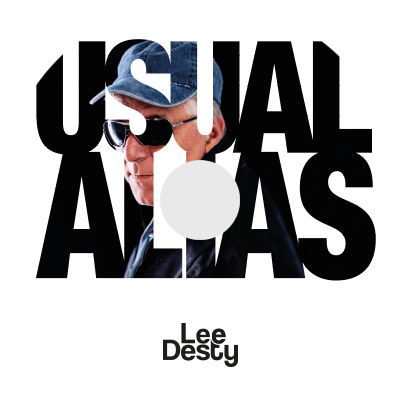 Usual Alias is my second album of original songs. Some songs are from the heart, some focus on the darker side of human nature… and some are just fun, written with my tongue planted firmly in my cheek.